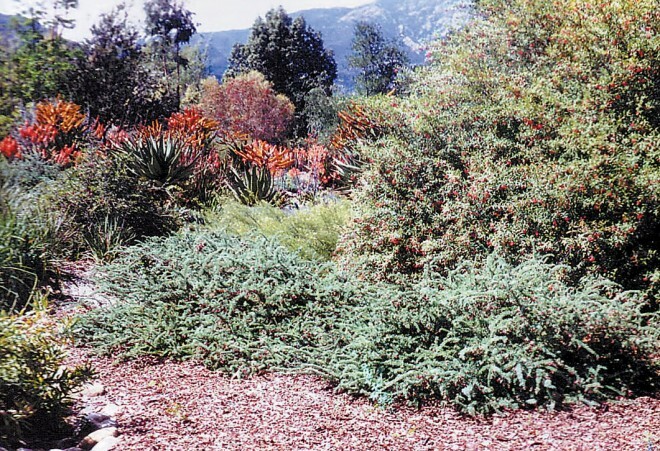 I first came to California in 1989-90 to develop a garden of Australian native plants for John Taft in the hills above Ojai, a project that was featured in the Fall 1996 issue of Pacific Horticulture (A Protean Garden). The soils there were slightly acidic to slightly alkaline, and many of the grevilleas that we incorporated in the garden flourished; some, however, did not, because of soils that were too alkaline, or because of weather anomalies (unexpected freezes and uncommonly strong winds). After completing that project (and marrying my husband), I stayed on in California and began to study how and where Australian plants were being used. 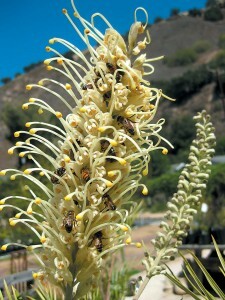 It was clear that only a few genera were commonly grown in gardens, in spite of their natural adaptation to the California climate; an even smaller selection of grevilleas was readily available to gardeners in nurseries, most of them hybrids that had been in cultivation for several decades. Clearly, there was a need, so I decided to open a nursery specializing in Australian plants. Now, twenty years later, the continually increasing interest in grevilleas and other Australians is encouraging. As more homeowners and landscape professionals have planted grevilleas, I’ve begun to see how adaptable they are here in Southern California. They still prefer well-drained soils, preferably on the acid side of neutral, and a sunny to only partly shady location. Some are better nearer the coast, while others seem comfortable in hotter inland areas. I can now recommend the following for their suitability in the Southern California garden. This Western Australian species has to be one of the easiest grevilleas to grow in our climate. Tolerant of cold snaps and heat waves, it can also handle both heavier clay soils and loose sandy soils; its beautiful lime green foliage does not turn yellow in alkaline soils. It grows well in full sun or partial shade. A fantastic embankment shrub, it is often grown for erosion control, as it is low (three to four feet tall) and spreading (six to ten feet). It can be pruned into a more formal low hedge or screen and makes a great barrier plant with its prickly leaves. This species produces profuse white, wonderfully honey-scented flowers in early spring. Birds, bees, and butterflies love the flowers and the plants make a good refuge for quail and other small birds. 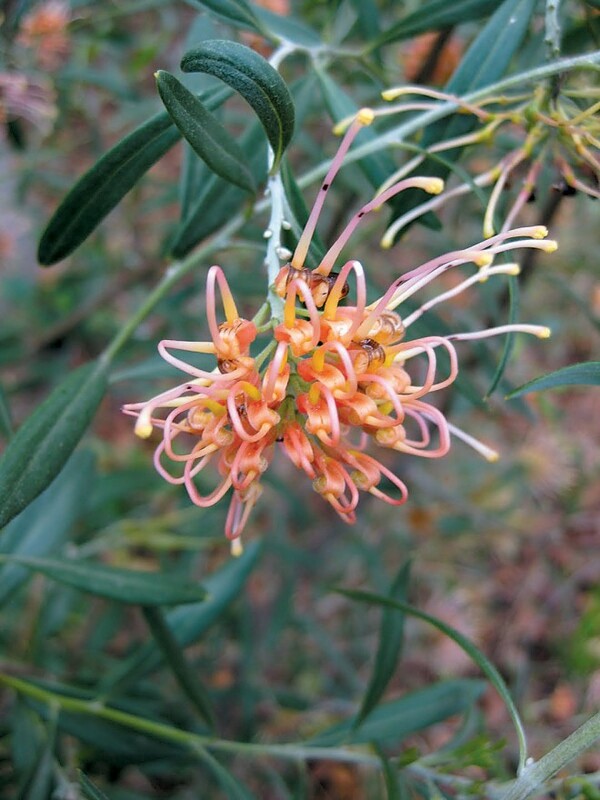 This is the Mack truck of the grevillea clan: it grows big (eight feet tall by ten to fifteen feet wide) and fast, especially in well-drained soils. It tends to be slower growing in heavier soils, until the roots have worked their way through the clay layer, and then it takes off. It will be more compact in full sun. 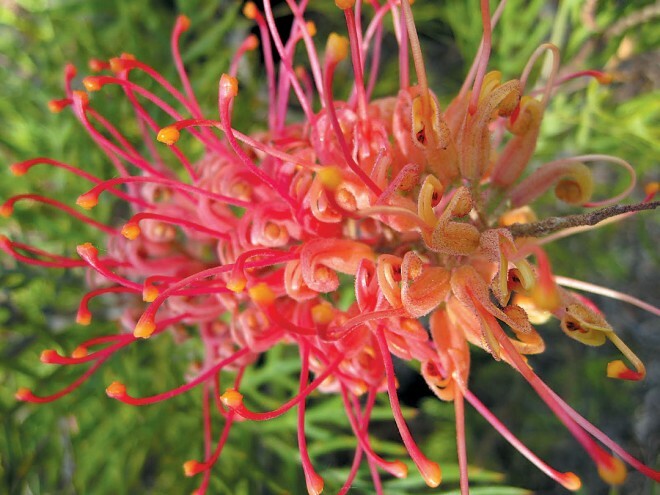 A prickly grevillea with creamy, scented flowers and green foliage, it is best in larger gardens and is excellent as a dense screen and barrier plant against unwanted visitors. 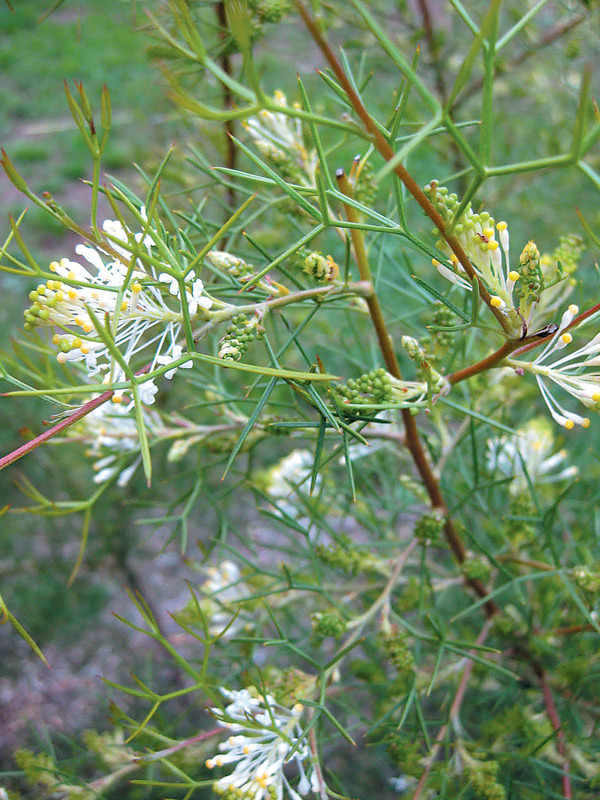 As the name implies, this Western Australian species has the appearance of an olive (Olea) but with profuse apricot orange flowers. Fast growing, it is tolerant of alkaline soils, as long as they are not heavy wet clays. It needs to be pruned regularly in the first few years to encourage more flowers in winter and spring. As the plant matures, it can be pruned up into a tree-like habit or kept as a large shrub (six to eight feet tall by eight feet wide). If planted when small, this species is good at withstanding strong Santa Ana winds. A great hedge and screening shrub, we often find birds taking refuge and nesting in our plants. This is a beautiful species with an open, graceful habit and burgundy, toothbrush-like flowers scattered along the horizontal branches. 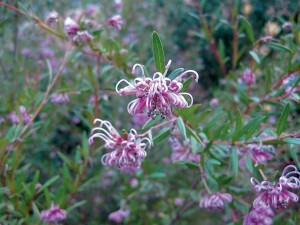 Another nonfussy grevillea, it thrives in Southern California, even tolerating strong winds. Often grown commercially for its foliage, the narrow, army green leaves with white undersides are as stunning in a vase as the cut flowers. Hummingbirds love it, too! This is one of several grevilleas that are tolerant of soils infested with the fungus (Phytophthora cinnamomi) that causes root rot in oaks. Woolly grevillea has several forms that thrive here in Southern California. The prostrate forms and the compact ‘Coastal Gem’ make wonderful groundcovers. There is also a shrub form that reaches approximately four feet tall and four or five feet wide. Gardeners on the coast and inland all praise its hardiness and tolerance of winds, heat, frost, and sea breezes. It has narrow, soft gray leaves and pink and cream spidery flowers that attract birds and bees from early winter through spring. Not too fussy about soils, it is also tolerant of Phytophthora cinnamomi, and it is happy in full sun or partial shade. The prostrate forms are perfect for growing over a wall, on an embankment, or in a container. This well-named cultivar does have a superb flower. In fact, it is covered in five-inch panicles of orange/yellow flowers for much of the year in frostfree climates. Pruning encourages it to produce even more flowers, which appear at the end of each branch. Hummingbirds and orioles love the nectar-filled flowers on this five-foot-tall by six-foot-wide shrub. This is a wonderfully fast-growing hedge for neutral to acidic soils; sulfur applied to the soil when planting in alkaline soils will release the iron that is locked up in alkaline soils. This is a handsome shrub for full sun or partial shade. Similar cultivars are ‘Robyn Gordon’ (deep pinkish red flowers), ‘Mason’s Hybrid’ (orange red flowers), and ‘Peaches and Cream’ (soft apricot and cream flowers). 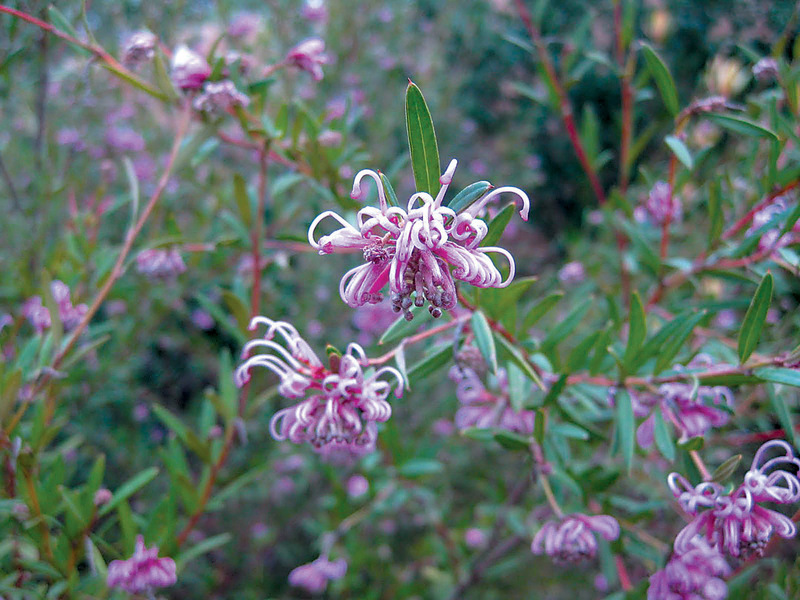 One of the most sought-after grevilleas in Southern California, this hybrid can be difficult to propagate and is often in short supply. Large clusters of coral flowers appear through much of the year, and hummingbirds cannot stay away from them. Usually an eight-foot by eight-foot shrub, they can get larger but respond well to pruning. The foliage will become yellowed in alkaline soils, but applications of iron sulfate or sulfur will correct the problem. For a smaller but similar shrub, try ‘Bonfire’, which has an equally narrow leaf and coral red spidery flowers. Both will make an excellent screen in full sun or partial shade, inland or on the coast. 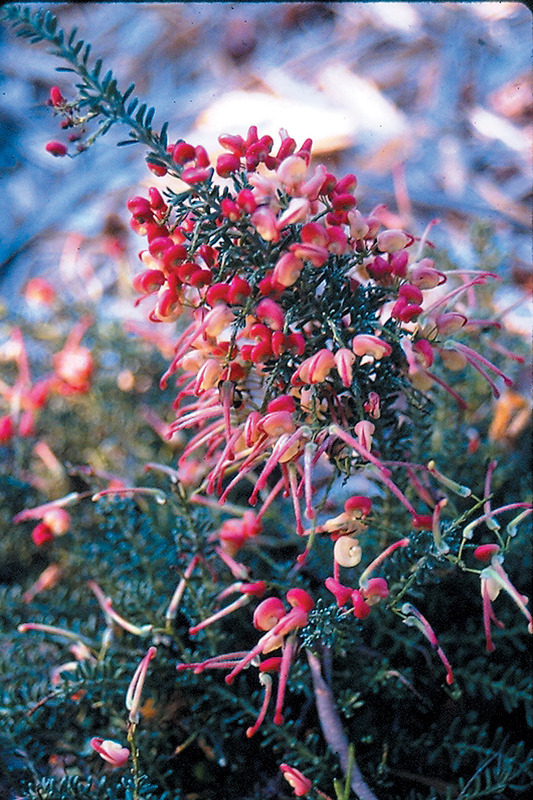 A lovely, fine-leaved, six-foot-tall shrub, this species can be grown in narrow spaces. The profuse, purple pink flowers from late winter through early summer are great for attracting bees and hummingbirds. It can be grown in full sun or partial shade. Pruning will keep the plant more compact, and will encourage masses of flowers, which are produced at the branch tips. Beautiful as a light screen, this species can be planted against a wall where it will tolerate the reflected heat. Foliage may yellow in alkaline soils; chelated iron can help correct the problem, as can sulfur for a long-term correction. 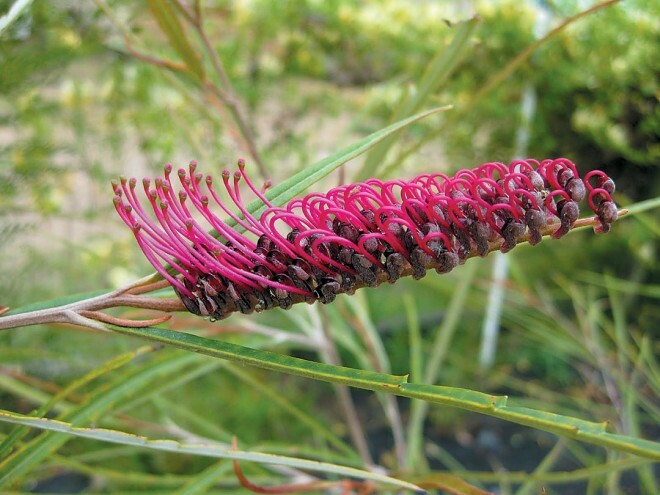 Similar in appearance but unrelated is ‘Pink Midget’ (Grevillea leiophylla X G. humilis subsp. maritima), a groundcover that flowers for much of the year. 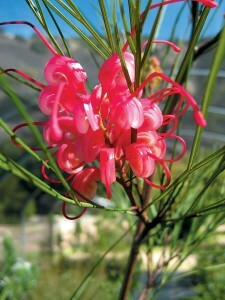 This cultivar had to be added to the list, as it is an easy growing, smaller grevillea for Southern California gardens. The gray, fern-like leaves and two-inch racemes of apricot flowers in summer add up to a lovely addition to any smaller garden. Usually two feet tall and three to six feet wide if not pruned, this hybrid is not fussy about soils and grows best in full sun to partial shade. It is perfect for planting next to a path or as a container plant.